Frequently Asked Questions about our venues and services. We understand that planning a wedding can ba a challenging endeavor. To better assist you during the planning process, we’ve provided answers to many common questions. Who will be handling my event? Grand Salon Reception Halls and Ballrooms team of Event Producers will be in charge of planning your event. The final details will be confirmed no later than two weeks prior to your reserved date. Where can I contact the Event Coordinator? The general rule is 9-16 months, but it is ok if you want to book earlier. Yes, but we have set a time frame between each event in order to avoid time and event conflicts. You have to sign a contract and give the initial deposit of 20% to 30% of the total value of the package; the date will be blocked for your event. We do not place tentative holds. What is the deposit to book a wedding or event? Events have a minimum $1,000.00 deposit, but it could be between 20% or 30% of the event depending on the event date. The Gazebo deposit is $500.00. Note: The deposit has to be in Cash, Personal Check, Money Order or Cashier’s Check. What is the amount of the Deposit to be paid? The Deposit is 20% or 30% of the event package total and $500 deposit for the Gazebo or Oak Tree Ceremony. The difference in the percentage depends on the date of the event. No, the Deposit is non-refundable because this is in order to lock in the date for your event. Once that deposit is given, the date can’t be sold to anyone else. Note: Payments can be altered depending on the event’s time frame. Visa, Mastercard or Discovery accepted for partial payments. 2% Convenience Fee will apply. Checks will be accepted up to 1 month prior to the event. The client must first provide a written notice explaining the reasons for canceling the event. The penalty from cancelation will be depending on when you booked as well as the time frame you are within the contract. The client will be responsible for either 50% or 100% of the total amount. What is the re-scheduling policy? Re-schedule is not always possible. It will depend on when you booked and the time frame you are within the contract. The client must first provide a written notice explaining their reasons to change the date. If the notice is provided 180 days prior the event’ s date there would 20% penalty Fee as well as an adjustment of the price per person based on the current prices. Note: Fees are subject to change depending on the contract and the time the event was booked. Can I decrease the number of guests? No. The number of guests cannot be decreased as well as the additional guests you add for your event. There are no refunds if fewer guests come the day of the event. All the arrangements were made for the number of guests you quoted us. Do children have a different price? No, Children over 2 years of age count as part of your guests. The costs of services included in the Packages are pro-rated among the number of guests. Children under 2 years of age do not count and will not have assigned sitting. Are the Bride and the Groom included in the number of guests? When are my final guests count due? The final guests count is due two weeks before the event. What is the service charge and Taxes? There is a 20% service charge and 7% taxes. The service charge is added to labor charges, purchased items, room rental, equipment rental, set up, meal service, clean-up labor, and event planning. Do I have Security during the event? You will have security officers at the entrance at all times. 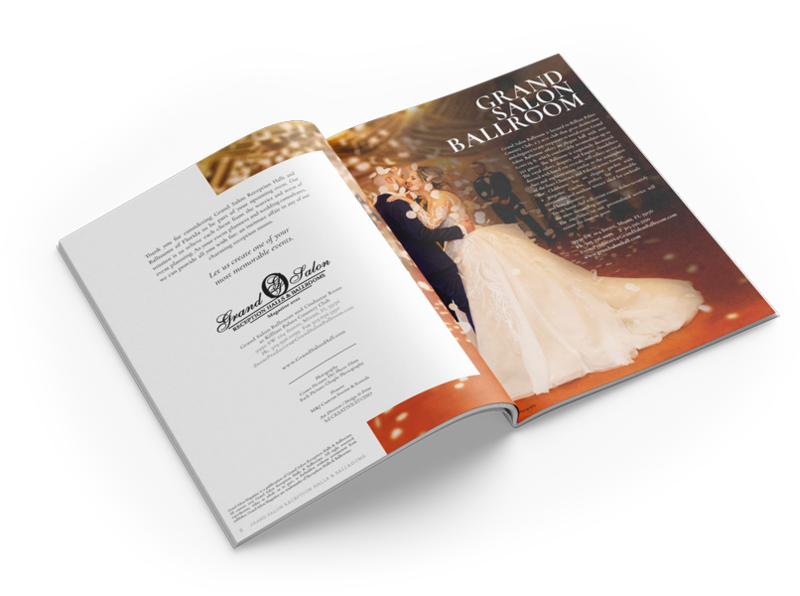 Grand Salon Reception Halls and Ballrooms will assume no responsibility for articles brought into Grand Salon by any person. Any property damaged or removed from the building or surrounding areas is the financial responsibility of the host or hostess. Can I bring Outside Vendors? What is an Outside Vendor Fee? The Outside Vendor fee applies to any company that is not one of our preferred vendors and that will be providing you any service throughout the Ceremony or Reception. We recommend you to contact us before hiring that company for approval. The outside vendor fee can run from $50.00 up to $100.00. Are Photographers or DJ’s charged under the vendor fee? No, they are not but Photographers and DJ’s cannot offer any other type of service that is not part of his specialty or service. They are not allowed to bring Photo Booth, Up Lights, Screen and Projectors, etc. We recommend you to contact us before hiring any additional services. Outside vendors’ fee might apply if approved by the management. Do I get to meet with the DJ? You will contact the DJ by Email or by phone. You will fill out a form with the type of music you preferred and the songs you will be needing him to play in given moments during the Reception. Is the DJ also the Master of Ceremony? Can I bring my own DJ? The credit for the DJ will be $100.00. If you bring your own DJ he should provide his own equipment and lights for the Dance Floor only. Any additional upgrades such as Up lights, Monograms or Screen and Projector should be contracted through Grand Salon Reception Halls and Ballrooms. Note: Contact the office before hiring or contracting those services for approval. Is the facility available the day before my event for set-up and rehearsal? Rehearsal is just for Gazebo Ceremonies and 15th or 16th Birthday Parties. It will depend on Room availability. Availability will be release until five days before your event but have in mind that an event can even be booked a day or two in advance. Note: You should always check with us before making arrangements with the persons involve in the rehearsal. When will I have the Room available for favor setting up in case another event there will be another event in the room? The room will be available one hour before the event. How long will the event be? It depends on the package you select. There are 4-hour and 5-hour packages. What can I do if I want to add an extra hour? How much would it be? The cost of the extra hour depends on the package selected. You can add it at any time or even the day of the event. Payment has to be cash or credit card (Visa, Mastercard, and Discovery). 2% Convenience Fee will apply. Does the event have to finish at a given time? No, there is no curfew in the area. What would happen in case of bad weather conditions? There is a plan B that will get into practice 2 hours prior to the event due to weather conditions. The event coordinator will contact the designated person to explain the situation .The Ceremony will be moved to the room where the Reception will take place. We will place a red carpet and the decorated table and the decoration if any in the dance floor but not the chairs and your guests will be seated at their tables. What decor restrictions exist for outdoor decors? Please, avoid sand, open flame candles, glitter, paper confetti, bubbles, silly string, and nailing, screwing, or stapling, nailing, screwing or stapling. Please do not use sparklers or rice upon departure and avoid putting any decor into the water features, including but not limited to floating candles and flowers. Note: Always contact us if you have a doubt with this please don’t hesitate to contact us. What decor restrictions exist for indoor decors? Do I have a choice of Linens? We will provide standard white or off-white floor length linen and organza ties if included in the package. Other linens selections would be with our specialty linen company. Do you offer Chiavari Chairs? They are not included in the package, but you can upgrade them at a charge of $4.00 per chair plus tax, service charge and the Set up & Delivery Fee. Are there any items that are not allowed in the area? For example, I read online that some places do not allow bubbles or sparklers, etc. If we wanted to set up extra things in the room (place cards, sign in table stuff, etc. ), would we have to do that ourselves? And if we do it ourselves, how early can we get in there? The clients set up those on their own or with the help of family and friends. We will let you know when the room will be ready the week of the event as well as the time to come in seeing that we can have an event booked the evening prior. Can I bring my own Liquor and food? No, all food and beverages must be supplied by our Full licensed facility according to the Food and Drug Administration (FDA). Can we get credit for the alcohol? No, even if you do not want alcohol beverages in your event, you will still have an open bar with virgin drinks and cocktails. Is all your food made on site? Yes, Grand Salon has a kitchen as well as an International Chef on site. All our cuisine is made from scratch with fresh quality ingredients. Can I taste the food? Yes. Once you book the date, we will schedule you for the Tasting as well. Tastings are scheduled two months prior to your event, every second Thursday of the month in the evening. How many different entrées can I select? You can get up to 2 main courses. In the case that the client would like to offer up to 2 different entrées, they will need to provide us with a head count per table a week prior to the Reception. The same salad and sides are served to all guests with their selected entrée (please refer to the MENU SELECTION INSTRUCTIONS attached in the welcome e-mail). Can bring my own cake and have a credit? Yes, but you will need to provide the license and insurance of the company offering this service. I would like to have a dessert station, can I do it myself? No, as part of the food regulations this is a service that has to be provided by Grand Salon Reception Hall. Can I do my own Candy Station? Yes, you can but only candies are allowed. They have to be wrapped and you cannot bring any kind of baked or home made goods. I have gone through this entire list of Frequently asked Questions and still need something answered. If you have gone through all the questions and still can’t find an answer that you need, please feel free to contact us through e-mail and we will furthermore assist you.